****PLEASE NOTE**** July 2017... The Photobucket website no longer allows free 3rd party image hosting, so as I have been going back into every post and replacing images with ones saved in Pinterest, I've been noticing that many of these images can no longer be in their original PNG format with a transparent background, and they don't always look as good on the screen. The header here is an example. Looping back this photo trail is the only way to afford keeping these posts, and is significantly changing the way everything looks. I'm sorry for these forced changes and am grateful for your understanding as I work through as fast as I can. At the very least, this keeps with our reused and recycled materials in the shop mentality as practically everything (materials wise) comes from dumpster dives and equipment comes from donated items. I guess dumpster dives might be a little extreme as lots of our materials are actually being set aside for me before they even get to the dumpster at MCK Woodworks. It's only sometimes that I have to dumpster dive by literally going into dumpsters. The Iron King trail is an abandoned narrow gauge mining railroad going through Granite Dells. 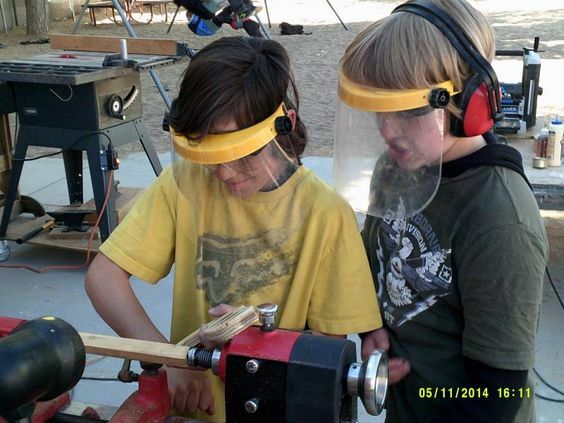 July 19, 2013... From the Franklin Phonetic School Wood Shop in Prescott Valley, Arizona... The photo above is from the Iron King Trail, just north of our school. I'm getting ready to go back to school... meetings for new staff begin in about a week. Franklin Phonetic School is a small Public Charter School. When I'm on campus, it is actually like walking back in time (at least 30 years) to a more innocent age. We are hearing from a lot of wood shop teachers all across the country. Many never post on-line comments but prefer to e-mail instead. If you wish to e-mail, remove NOSPAM from the address. View one teacher's letter to America... a great example of what's happening in "traditional" public school today! And here is the result in Arizona and I found this about something that's happening to some older teachers in California. ***UPDATE*** December 2014... Now that I'm here teaching, rarely if ever have I seen students with cell phones. I never hear profanity like I heard almost daily at my previous school. I haven't seen any fights. Students are excited to be in my class... not that they weren't at my previous job, but here, they come into the shop anytime I leave the door open and I have to limit how many can be here. I often have the younger kids (I teach 4-8) lining up along the fence (old shop location) so they can see what the older kids are doing in wood shop. If I let the younger kids come into the wood shop during recess, it almost always becomes a huge crowd. Parents are involved and are frequently on campus. It hasn't taken long to fit in here and fall in love with teaching all over again! I asked teachers on this forum for middle school project ideas and was a little surprised to have had only a couple of teachers respond. Bob Itnyre actually sent a box with some fabulous samples which I just received. These teachers now have a 64 GB flash drive fully loaded with woodworking/construction curriculum. Now I can't wait to show the students all these project choices. Earlier, while I was waiting for responses, I decided to try coming up with some project ideas that would use up some of the hundreds of 1/4" 1/2" & 3/4" panels given to me by the MCK Woodworks cabinet shop owned by a former student of mine from 1981. 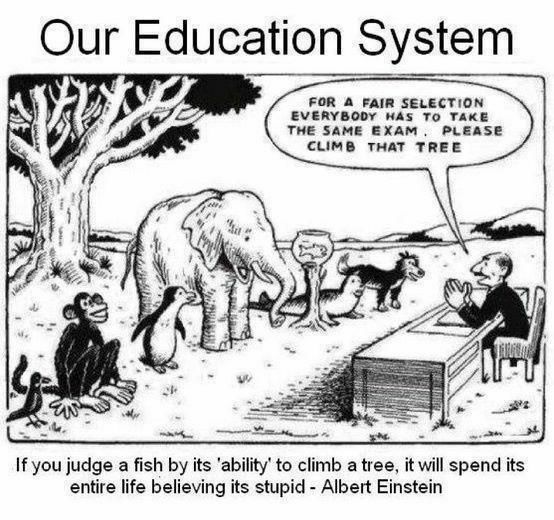 I was looking for something a little different... and knowing that my situation doesn't have much equipment, everything had to be designed around our limited resources while also taking into consideration class sizes of 6-10 students. Since students meet only once every week and a half, and have maybe 45 minutes to actually work, I want them to feel safe and comfortable around the equipment, have quick early progress and easy success so they quickly build skills and get hooked on woodworking. To me, woodworking is a lifestyle, although I know that many people might not feel the same. 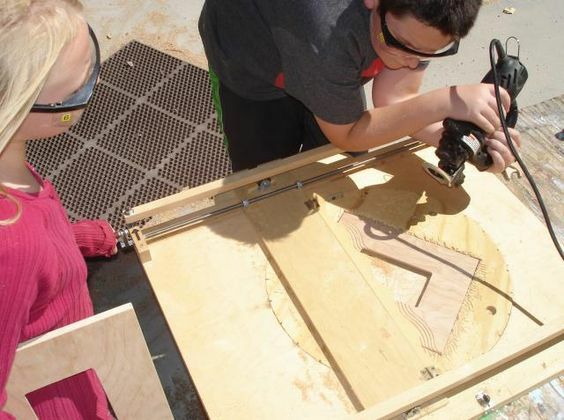 My worst fear is that some students might not want to try machine woodworking out of their own fears of the equipment, or that I might say or do something along the way that turns them off of woodworking altogether. I would like to see everyone succeed, so I came up with some ambitious ideas, including some new jigs. I know these projects would have been well received by my beginning high school students. I just hope they like them and it motivates them to work hard. I will do everything in my power to keep students interested, safe and successful. Thanks to local business competition I finally have high speed Internet at home, so I uploaded to DivShare what I have completed so far. I hope the students will find them interesting and will enjoy working on them with me. ***UPDATE*** Sad to say that DivShare doesn't work anymore as you may have already noticed, or will soon discover as you read through these posts. Wavy Frame Instructions The frame is simply 1/2" MDF cut to size and placed into a jig to route out the center, then flipped to route a rabbet for the photos. 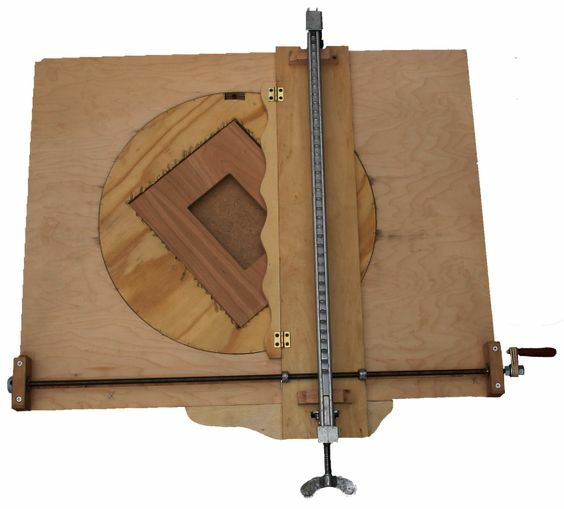 This no miter frame jig was made by one of my students & featured in American Woodworker Magazine I later updated it to include a screw driven fence so students don't have to fuss with measuring, sliding the fence over, and clamping it back into place, a very time consuming effort. Simply count 3 or 4 (or how ever many) turns of the crank per run, or make them more random by changing the turns per run. 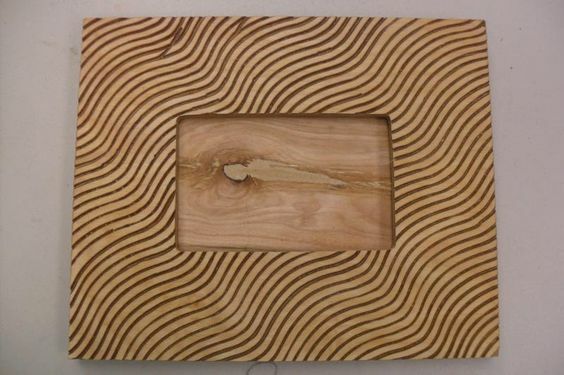 Another random effect is to rotate the router base slightly during a run. That is how the frame was made in the photo above. The circular part holds the frame at any angle. The wavy fence can be lifted (hinge) out of the way for making straight runs. I later decided to add hold down bars (not shown) to keep the jig together better when small inexperienced hands are using it. I also added registration clicks so the frame angle stays set easier. It can still be placed in odd angles (outside of click marks) but for those students who have trouble keeping it from slipping, we just click it on a pre-set angle. The circular sliding center was cut on the table saw.... a neat technique every high school student should see (and maybe even practice) at some point in their shop education. ***UPDATE***I haven't been great about documenting student projects. They mostly get out the door before I think about taking a picture of it, but our yearbook teacher sometimes comes around to take pictures and captured these photos of students working and projects they have made. These yearbook shots may or may not be the "Best of Show" but they certainly are completely the students own work. This frame made by a 7th grader is really pretty good considering they were upset about the mistakes. I think it's a beautiful frame. ***UPDATE*** These 6th graders are using the wavy frame jig. Since smaller students had trouble keeping the fence down on the jig (which allows the router to slip underneath) I added some extra bars across the top to help hold the fence down. For durability, small steel wheels keep the fence down tight yet allow it to move freely. They came from old casters (like what are found on the legs of antique dressers). I came across a bunch of them one day while helping someone clear out an old garage. 4th graders working with the frame jig. ***UPDATE***This frame is also by a 7th grader. OK, I admit this one caught my attention and I asked this young lady if she would mind going up to see the yearbook teacher, and if she would let the picture be posted. Good job Laine. Laine is in wood shop again this year. 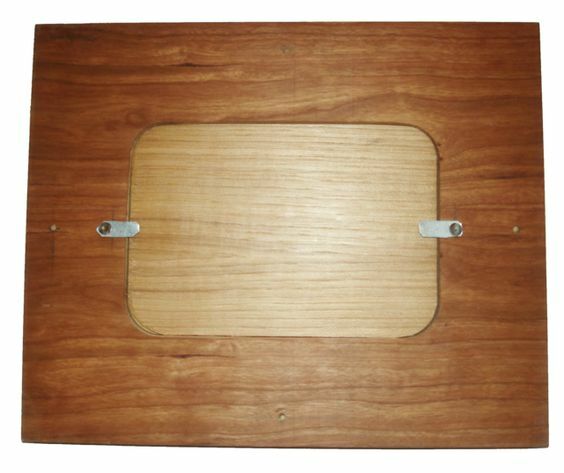 ***UPDATE*** Here is what a typical frame looks like from the reverse side. ...a 1/4" thick pre-cut rectangle gets placed into the cradle and the cradle is swiveled over to the other stop... cutting the corners for a perfect fit. Of course in a pinch you can simply trace the corners using a fender washer of the same radius, and sand them off right up to the line. ***UPDATE*** 9-22-15 DivShare is no longer allowing free user access when I attempt to sign into my account. That means you also might not be able to download materials either. As I get inquiries from some of you, I often find I have to now send photos and other materials over e-mail. As I have time, I will try to go through and find ways to upload all these materials to photobucket so they can be viewed directly from these pages. This is the cutting jig for the no-miter frame.... as seen from underneath. 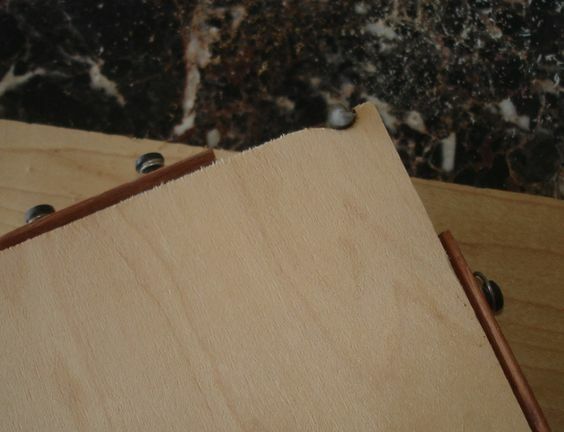 The split in the miter groove rail allows for adjusting how tight the jig holds in the groove of the router table's removable auxiliary table. 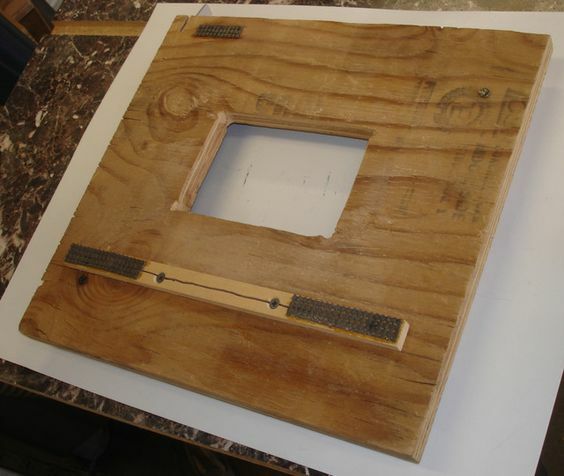 This is the same jig looking from the top side. The white paper underneath helps you to see the details as the auxiliary table has a busy pattern in the Formica (is made from a sink cut out I snagged at the cabinet shop). 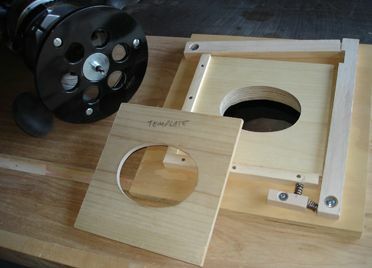 Here is the jig mounted in the groove of the auxiliary table. Notice the dust port lines up underneath for carrying away the cutting debris. 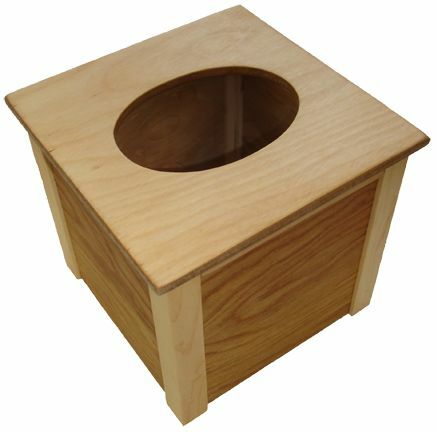 A starter hole is drilled through the waste rectangle to be cut out of the blank. The template lays directly over the blank and guides the router bushing/sleeve... cutting away the center rectangle for a 5" x 7" frame. The assembly gets flipped and a rabbet bit goes around that opening to create the photo and backing space. 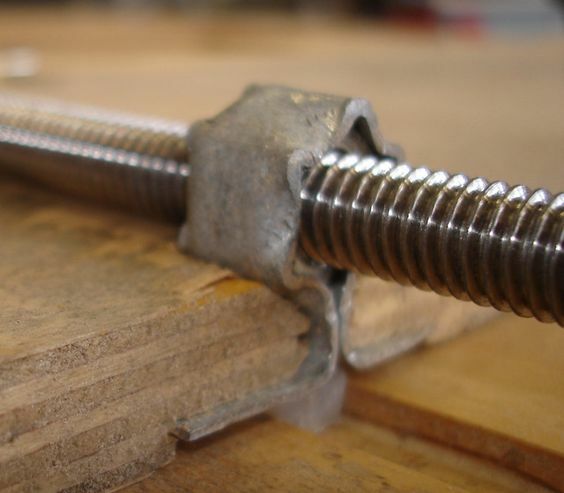 The fence is screw driven by a hand crank on the end of threaded rod. The threaded rod is run through a skate bearing at each end to minimize drag. Two drive nuts on the fence are held in place by hand made heavy gauge sheet metal brackets that are bent around the nut and protrude through the fence. 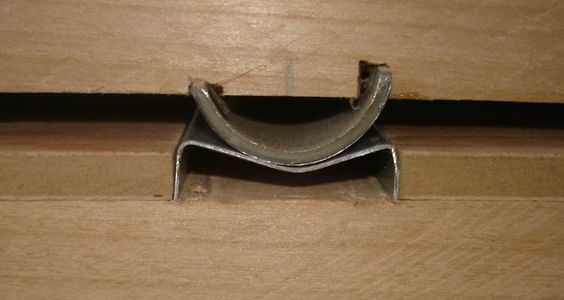 A nylon slide can be seen below that, which runs through a groove the length of the jig.... to keep the fence on track. A spring loaded registration pin and lever allow the frame jigs circular center to be set to, and held in, a variety of angles to the fence. 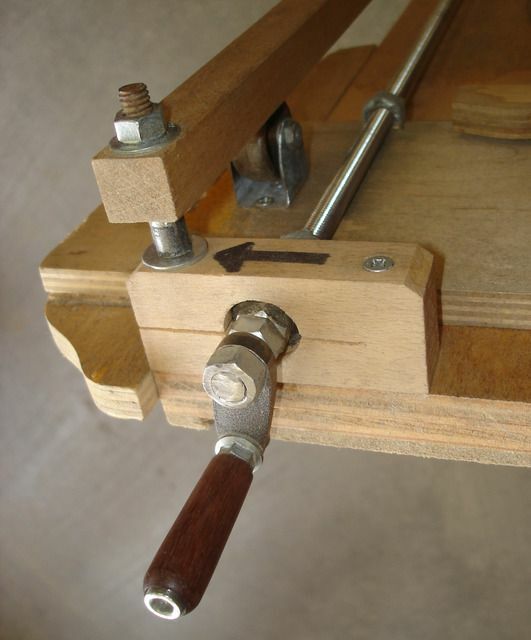 To help keep the frame steady as a cut is made, a spring loaded clamp at the corner applies diagonal pressure to force the frame into the opposing corner. We have found that there should be a 2nd corner clamping devise on the same side as one clamp does not exert enough pressure to hold the blank secure enough. To get by when we have difficulty holding a frame during routing, we have rolled small tubes of scrap paper, and bent them so they fit tight into the excess space surrounding the frame. One of these days I will get around to installing a 2nd clamp. The free end of the fence is held down by spring tension. At our old shop location, the jig often spent the entire day baking in the southwestern sun, occasionally getting a little rained on and making it look old before it's time. If time permits, I may rebuild the jig with a set of sprockets which will drive both sides of the fence keeping it perfectly in position as well as easily adjustable. Someone gave me two 1 1/4" sprockets that would work perfectly for this. A bike chain between them would move them at the same rate. Also, after e-mailing back and forth with a new member, an idea was hatched to switch the fence system to a changeable template system. So, you may see a new jig down the road. Thumb Piano Believe it or not, the most expensive part shown here are the wing nuts. The bridge is 1/2" electrical conduit. One of my 6th graders lives near by and I asked his mom if he could come over and try one of my new projects. This is the one he picked. His looks just like this except he cut a star instead of a round shaped hole. This picture looks really cool here because I took out the background. That's why it shows so well on this site. 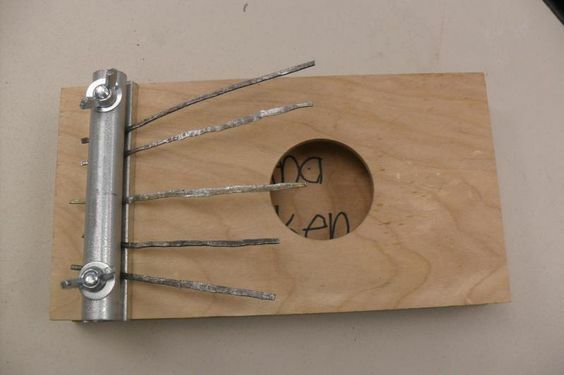 ***UPDATE***This thumb piano was made by a 4th grader. As the 4th and 5th graders struggled the most with hammering these tines out of old coat hangers, I eventually cut apart old leaf rakes (see pane 21) for their tines. Not only was that easier for them, but they got the correct amount. This is also an example of someone who didn't think about where they placed their name, so it shows. However, I think it is a cute example none the less and a priceless treasure. While uploading I noticed that DivShare inactivate uploads if no one looks at them for 30 days which could be why so many of you have had difficulty obtaining items I've shared previously. Please let me know when that might happen to you and I will simply delete and re-upload items. Here are the new folders you may want to check out. I also made a presentation to our area wood turners and they are going to supply some brand new mini-lathes, tools, bowl chucks, mandrels, turning blanks, pen kits, and guest speakers. (Download the newspaper article) It didn't hurt my cause to have been featured in national publications such as WOOD magazine, American Woodworker magazine, and because of this presentation, the most recent article about Franklin Phonetic School wood shop is in the June 2014 issue of American Woodturner magazine on the bottom of page 13. This link was added later when the magazine was out for a couple of years. If you go to the viewer, the pages shown at the top don't correspond with the actual pages, but if you type in 15 and enter, it goes right to the top of page 13. Scroll down and you can see it there. The school recently purchased a nearby business and are remodeling. Two of the units still have active leases, but that might change shortly and there is talk about doubling the wood shop space. *** UPDATE*** Late October- Work is currently being completed on our new cafeteria (running a little behind schedule) and then work will begin on a new shop space in the (see pane 27) old cafeteria. I'm looking for projects that are new, different, and maybe be reminded of older projects that need a little updating. I'd love to get some feedback. I'm always trying to improve. I've gone back and put in pane numbers so identifying something should be easier when you e-mail to discuss anything posted here. If you haven't already looked at some of the uploads of these not so ordinary projects, you might want to check it out. Not only are there photos of the completed project, but also photos of all the jigs involved. And for anyone who needs them, I can certainly upload more detailed photos of the jigs. I appreciate everyone who has e-mailed and I also appreciate those who are sharing their project ideas with me. I'd love to see your new stuff and will send a jump drive. Look for an address request in your woodshopteacher@cableoneNOSPAM.net mailbox. Bob- More cool stuff came today! I'm so glad I asked you for ideas. Thank you very much! I love it all. I have to ask.... can you give me the precise lengths for the xylophone pieces? I would use these pieces as a template, but as you said, the student was off a little when he made them. 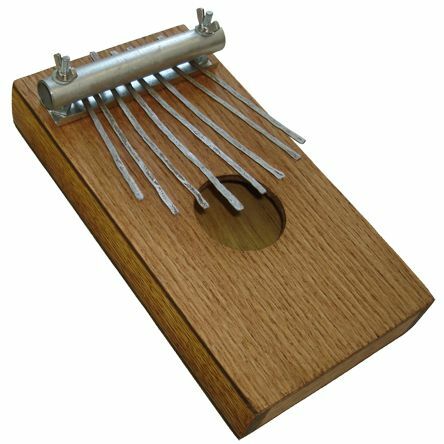 What a perfect project to go with the drum and thumb piano. 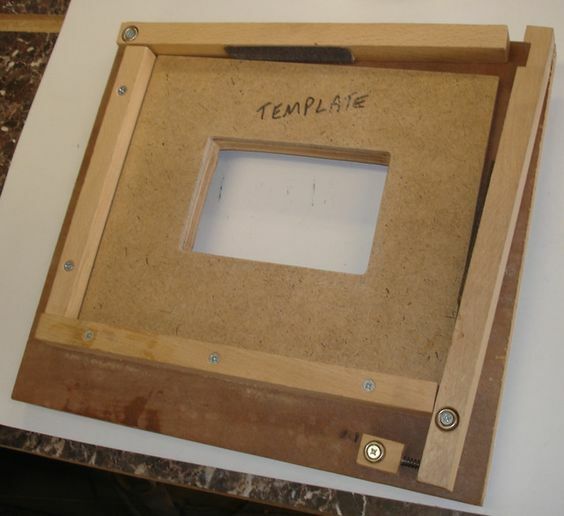 Did you have a template for making the cross pieces. My first thought was for making a template to cut a groove to mount the cross pieces into the base. This school is very art and music oriented so musical instruments will only make wood shop look good. Joe- Got your message. Send at least a 64 GB thumb drive and I'll give you everything I can fit onto it. The curriculum has all been updated and reorganized a few months back. It may be my last update since all my material will also work for middle school. I did run across and recently add a good general safety spoof from Mad-TV. I thought I would add a few photos of the new jigs I made this summer. This is for a series of tissue box covers. All sizes use the same corner jig. 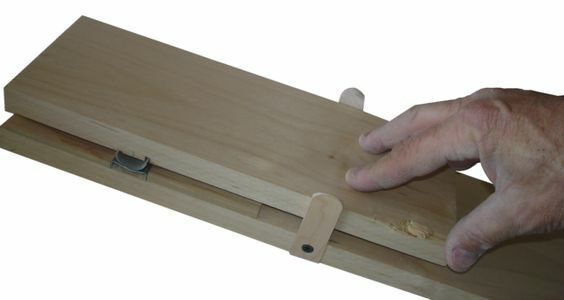 Larger boxes use a different top jig. This is a great way to use up small 1/4" panel material, and also for mass production if you need a fund raiser. All my materials were donated by MCK Woodworks, a local shop owned by a student I had in 1981. 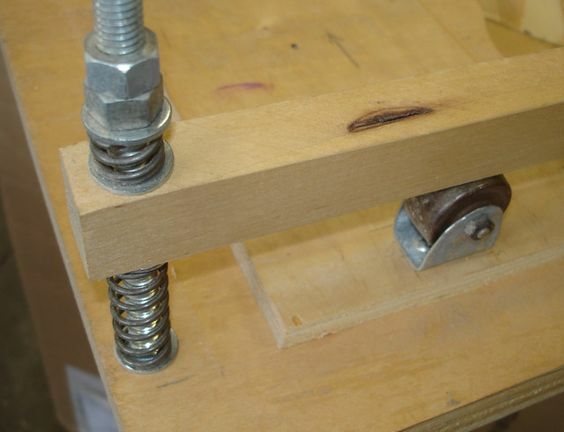 Tissue Cube Top Jig- This is spring loaded to keep it shut and also for quick release. 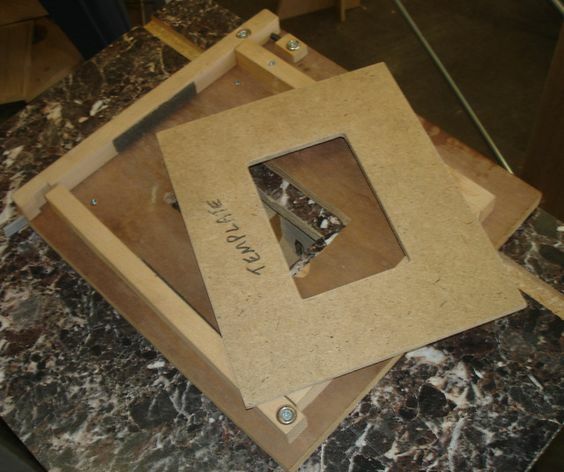 Tissue Boxes Corner Jig- The tilt holds the material down as it is being pressed towards the fence. It is also used to make the top rail seen in the project photo. 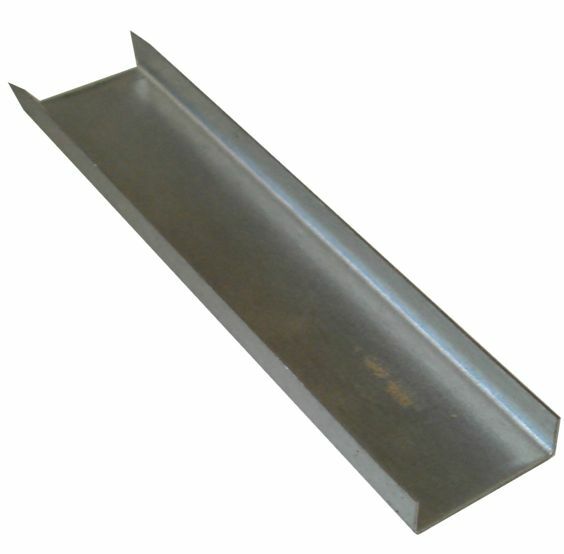 A simple cover (not shown) guards the blade. 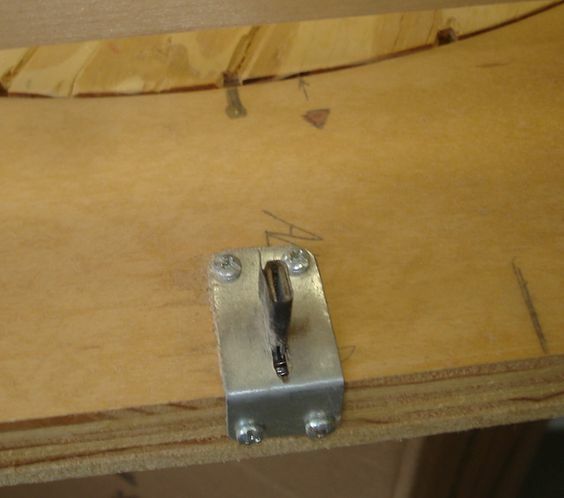 Corner jig made from a discarded skate wheel. ***UPDATE*** Everything about this project is easy except the assembly. I have to pre-cut all the fine pieces ahead of time, but from there the students do the rest. If the students aren't careful when gluing and assembling, they can make it too tight for it to properly fit over the tissue box. Glue is unforgiving in dryer climates like this. It adsorbs and adheres almost instantly, so there is little chance to pull it apart and salvage mistakes. Have you considered Intarsia projects? Some are very easy easy for beginner and can be very complex for advanced students. Check out my site www.kathywise.com for some ideas. I have beginner kits as well. My newest book 'Intarsia Birds: Woodworking the Wise Way " is a great bargain with 30 patterns and step by step instructions for only $20. Your work is beautiful and I know some larger schools can afford to do this and their students are usually in class every day. I have to scavenge for cabinet shop scrap and students will take weeks or months to do a simple project because they rotate into the shop one class period every other week. 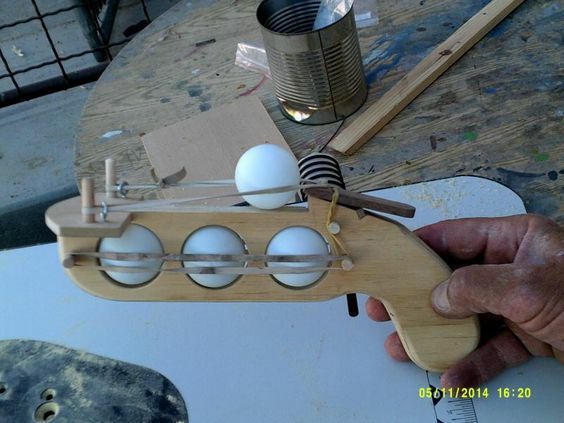 The Ping Pong Ball "Launcher"
I thought I would add this cool project even though it's probably not appropriate. 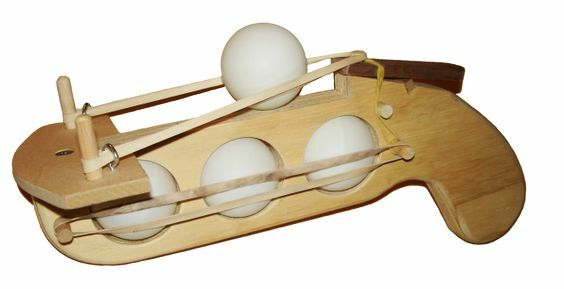 I found a photo of this ping pong ball shooter (officially now called launcher) on-line and it's an attention grabber for sure. I made one up from the photo and switched the trigger system over from a clothes pin. I also made some templates just in case they allow this as a project at our school... of course leaving off the rubber bands and ping-pong balls. **UPDATE** A funny thing happened during testing week. The superintendent unexpectedly approved the ping-pong launchers as a diversion from testing. The students produced almost a hundred of them. It's definitely a hit. When I came back in August, I loaded up a box of unfinished launchers which our 8th graders will complete so they can be sold for the 8th grade trip. We had a fun time in Disneyland last year. The holes in the template mark the centers for drilling. 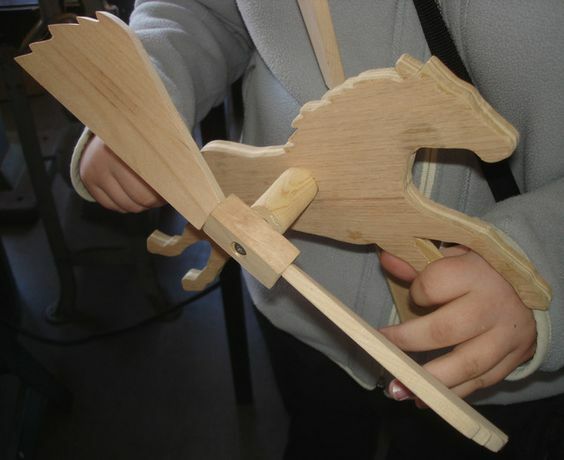 I ended up simplifying the project by using clothes pin triggers when the students made theirs. ***UPDATE*** The clothes pins are not as good as the original trigger design. 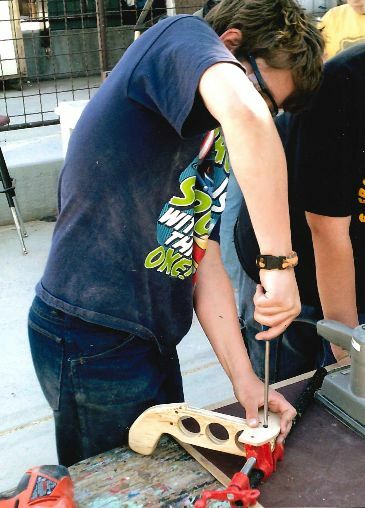 The clamp in the photo keeps the MDF or plywood from cracking when this 7th grader drives the screw in. This project is very popular among all age groups. 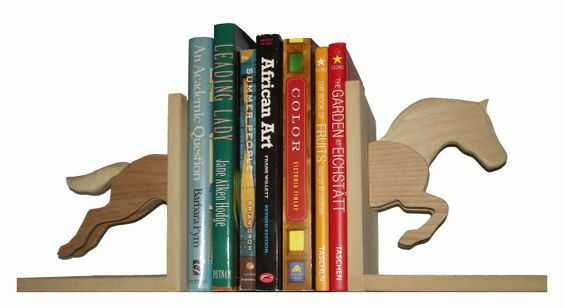 4th graders are currently my youngest and they can easily make them, although I usually step in to do the edge round over on the router table. To save money we use bailing wire instead of screw eyes and ping pong balls are 6 for $2 at Walmart. ***UPDATE*** September 2015- The police sends an officer around at random times to walk our campus. The other day one was here and I invited him in to see the new wood shop as he went by. He came in and marveled at all the unique projects we were doing.... while reminiscing back to his own school shop experiences. He was disappointed that so many schools are eliminating these types of programs that teach such vital skills to our youth. I thought it would be a great idea to ask him about the political correctness of our ping pong ball launcher. He said he thought it was a great idea and he didn't have a problem with it because it is clear that it is only a toy. Maybe we need another movement called "Children's Lives Matter" when it comes to great programs like these that are disappearing from our schools! The government seems to be abandoning us in favor of common core. The public (especially retirees) aren't always receptive to school bonds and overrides to supplement the states cuts to education. And finally, everyone... especially educators... need to be aware that removing shop classes from our schools is discrimination that crosses all racial lines and hurts the future of our country. Now that I am teaching middle school, I'm always looking for something really different to excite the students. I've recently been experimenting with laminated pens made from simple to obtain woods such as maple and walnut scraps that are free from the cabinet shop. The contrast gives the project that special pop that really gets the attention of everyone. 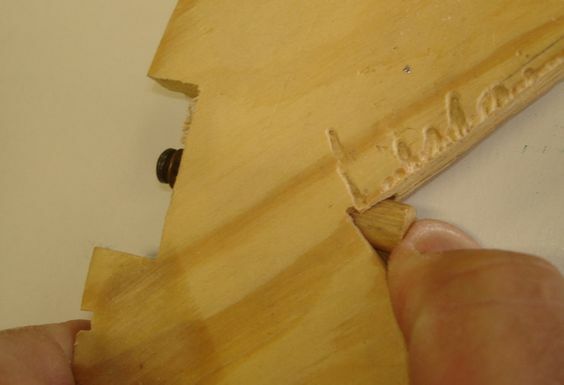 The upper pen was made from discarded cutting board scrap ends. The grain runs the wrong direction making it easy to split when rough turning. 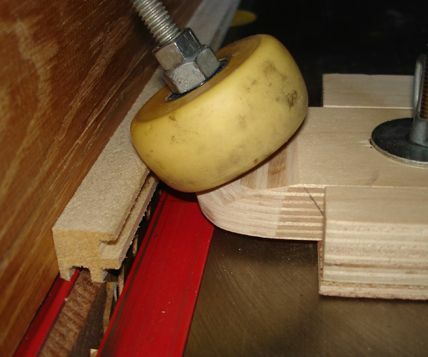 Pre-rounding can be done either off the lathe, using a belt-disc sander, or on the lathe using 50 grit sandpaper. Once round, it is easily sized, shaped, sanded and finished. The checkered pen will require cutting on the table saw. 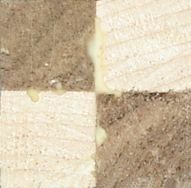 Looking at the end grain below, 5/16" x 3/4" pieces are cut from contrasting woods. The pieces are glued and clamped together. After they set up, they get cut down the middle creating two pieces with walnut and maple on each. One side gets turned over and they are glued back together with alternating dark and light. This has to be extra long to leave space for crosscutting about 1/4" to 5/16" long pieces. 18" would easily make three pens and would also be easier to work with during the process. I use a zero clearance insert to keep the small pieces from being sucked down into the table saw. Each half of the pen is made from about 6 to 8 of these layers that students glue together after turning every other one to form the checker pattern. If they don't lay flat together, they could split when clamped so watch out for crooked cuts or crumbs in the glue joint. After the glue has dried, the completed pen blank is drilled and mounted on the mandrel. The more accurate you drill on center, the better the checkers line up. It might be a good idea to show the students how to drill on the lathe with the blank mounted in a lathe chuck and a drill chuck & bit in the tail stock. I also drill from both ends and meet the holes in the middle. Then I use foaming gorilla glue to fill any possible gaps where the drill meets in the center. 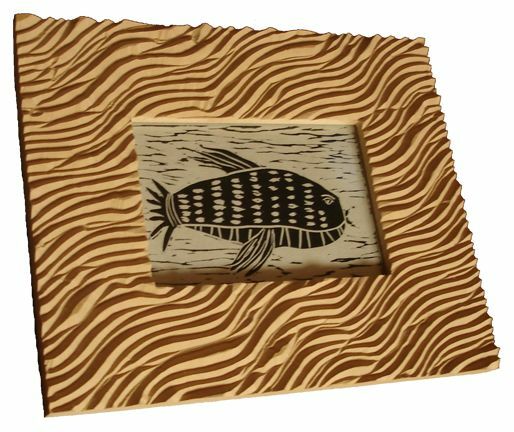 This pen blank will act just like a solid piece of wood as it is turned to shape and sanded. 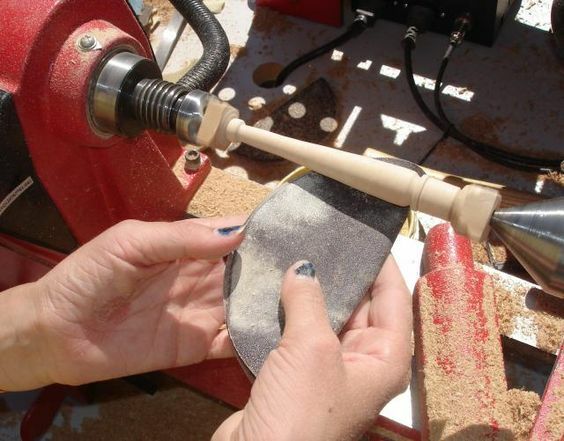 Pre-rounding with rough sandpaper helps but isn't a requirement for experienced students. When gluing the checker pattern, line up the center line before tightening the clamps. I'm not a big fan of buying Chinese made tools, but these Harbor Freight 6" clamps always go on sale for $2.99 and are some of the best soft grip handle clamps I've ever used. 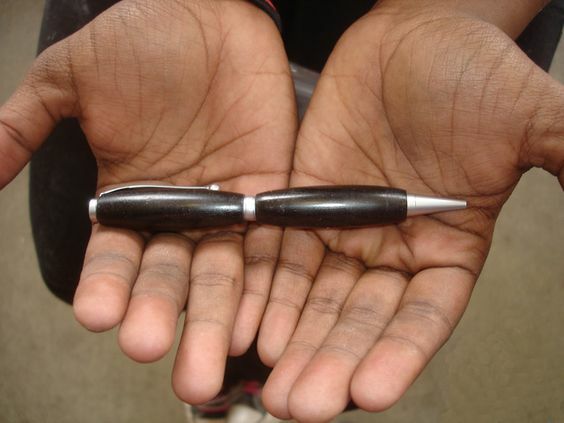 If the students want to make pens, they have to start with making a small bat. I tell them if you can control the tools well enough to make the bat correctly, then you are ready to make your first pen. 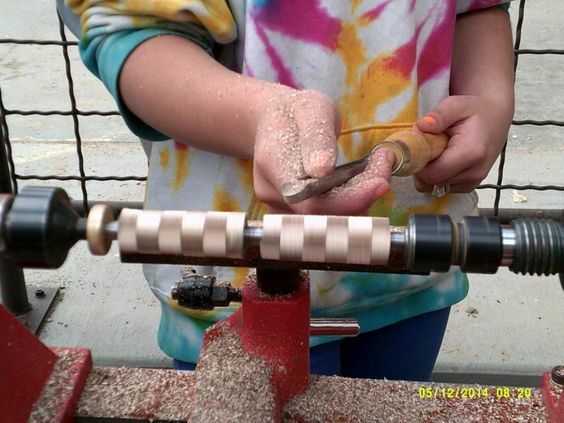 ***UPDATE***This close up is an 8th grade girl turning a checkered pen. Almost every one of the checkered pens (including this one) turned out great, except for one that blew apart and couldn't be salvaged. The students are learning that a light touch is sometimes required. 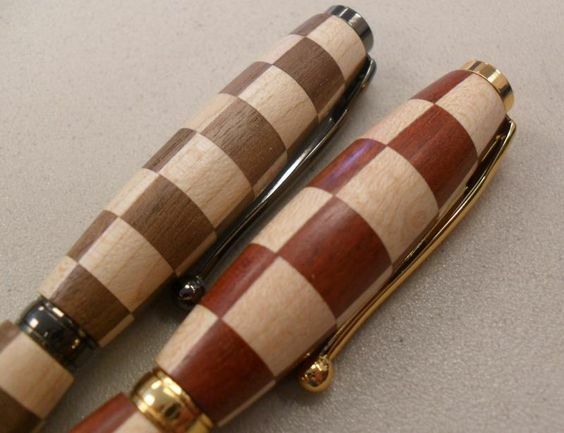 ***UPDATE***Here are just two up close examples of finished checkered pens. Seth has his own lathe at home now. He first started selling his work from his mothers Facebook account. Now he has his own Etsy shop. 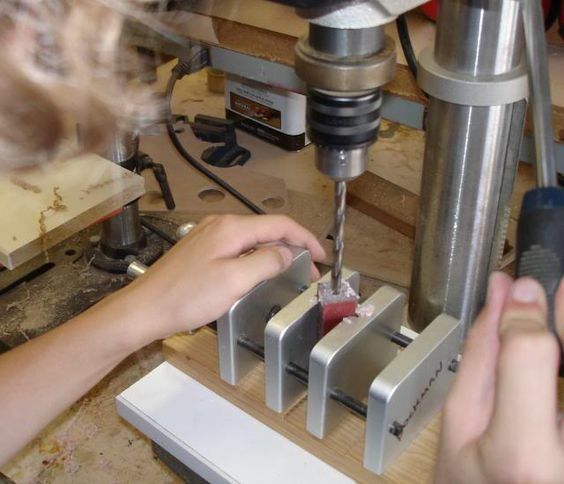 Seth brings his pen blanks to school to be cut and drilled. ***UPDATE*** 10-28-15 It's hard to capture in a photo, but this naturally talented 6th grader is sanding her first pen/pencil and has absolutely nailed the turning, while creating a fabulous and comfortable shape. 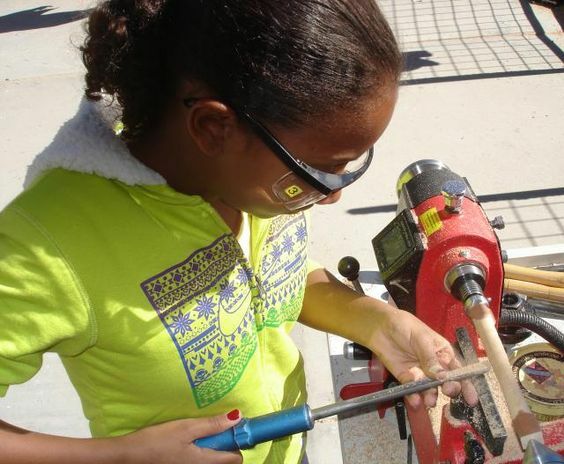 (see her featured at the 2015 Charter School event) At the same time her identical twin sister uses the scroll saw to perfection, making the straightest cuts I've seen in someone this young, showing that they both definitely possess a superior ability of hand eye coordination. 4-7-16 Here is a great example of an ebony pen made by a new student who has been here only about a month. I asked my admin last year about the ping pong ball launcher and they also said no. But they were OK with the students making mini baseball bats, which could actually be used to beat someone. The children are positively talking about the shop at home and I'm getting many visits from curious parents and older siblings. I just renegotiated my contract for next year. I've been bumped up to 3 days a week. I'm trying to come up with many things that the students will really want to make. I want to keep them interested every year they are in the woodshop. With 4th grade through 8th grade, there is a lot of opportunity for them to be here and complete many projects. 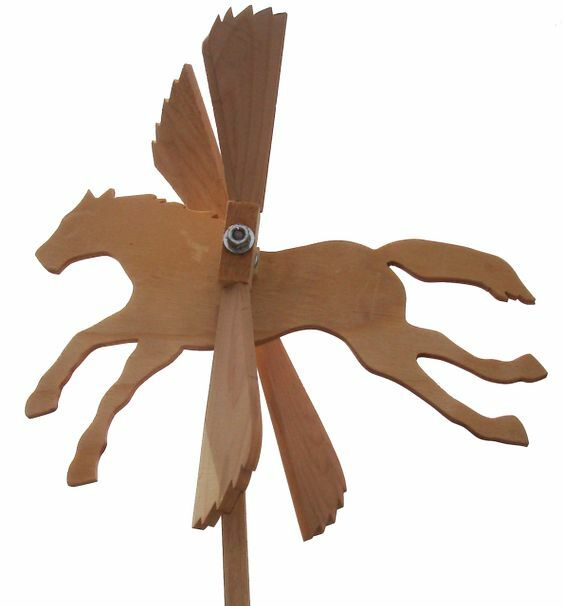 Here is a simple (Pegasus) whirligig idea found on the Internet. The wings are spinning in opposite directions. (video) It's suppose to be painted white. I've completed a pattern for cutting out the body and wings. 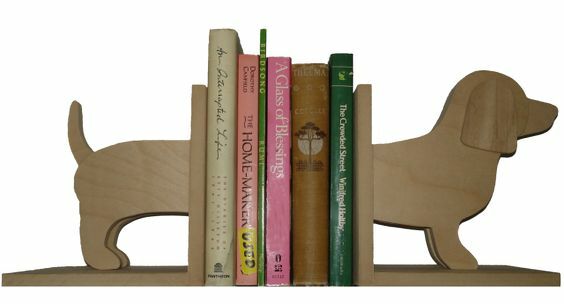 I'm working out other whirligigs and I have A-Z book ends (pattern) and wiener dog book ends (pattern) that I will photograph and post soon. I've had many students build these, but somehow always manage to not get any photos of them. ***UPDATE*** 11-17-15 That is, until now. This student worked and worked and worked... since we were in the other shop and she was in 5th grade.... to complete this project. Various parts had to be remade multiple times. She probably took longer than anyone else, but I'm so very proud of her perseverance. She never wavered. I'm just sorry I never posted photos of any of the others. There have been many, but there are just times when you get too busy to take a simple photo. Shame on me. Tom, can you explain how you got the wings to be angled? Most of the wirlygigs I have plans for have complicated angle cuts to make them spin. I didn't use plans but instead tried to figure out a way to do it just from on-line photos. I could tell it was a one piece wing, but for me it has to be something my kids can do, especially with the limited tools we have available. I went through several prototypes before I ended up doing it in three parts. I cut tenons on the end of the wings which then got whittled down close to round, and run through a die making them close to a drill size. I think they are about 5/16" round, maybe 5/8" long. These are fit tight by drilling a hole into a center block. This allowed me to test the blade pitch so I could adjust them to spin even with a light breeze. I was also able to balance them perfectly. They have run for days without being glued in, and are working smoothly. I won't glue them just yet because I want to be able to take them apart for the students to see how it's put together. This three part wing assembly is mounted using all-thread with spacers leaving enough room for each wing to freely spin. A nut on each side of that keeps this center pin firmly in place. Metal sleeves are placed through the wing center block so it won't drag on the all-thread. 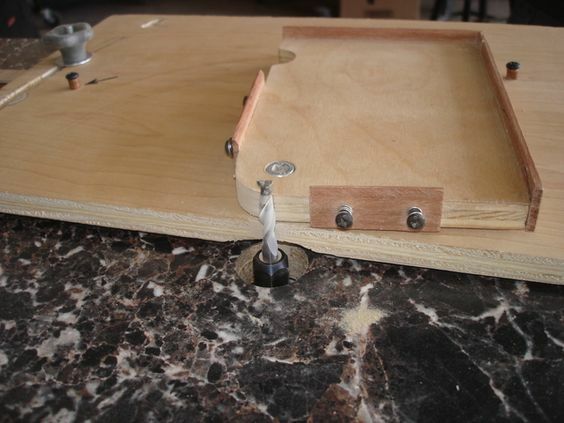 Washers go on both sides of the center block and a nut loosely holds it in place so it is free to spin. I lightly crushed the outer most threads to make the nut stay in place. I set it outside the shop today and everyone who saw it went nuts for it. I told them we aren't ready to build it this year since there's only two weeks left before summer break. They need something to look forward to and I have to get parts together. Rarely does the final project come out exactly like the prototype, because I want to find as many pre-existing parts as I can so we aren't forced to make them ourselves. That's one reason why the final ping-pong launcher had a clothes pin in place of what my prototype had (see photo). I left Pegasus at school today, so I can't take more photos right now, but if you, or anyone else wants me to take it apart and lay out all the parts for a photo, I'm more than willing to do that. Thanks for the info!! It makes so much sense. Along with the A-Z bookends (not shown yet)... here are some of the other completed bookends with links to the tracing templates. 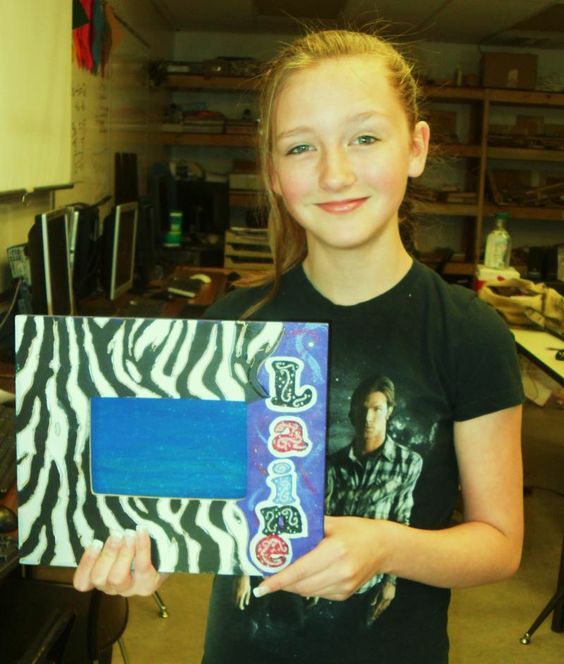 It's a simple project that even the 4th graders can do. 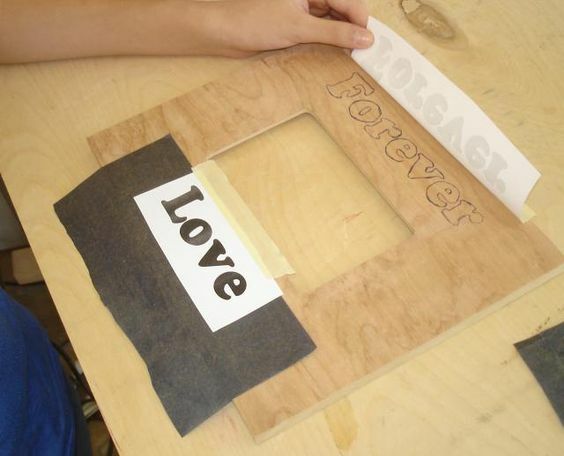 Cut with the scroll saw, differing thickness plywood layers give it a more 3-D appearance. A little sanding, a little paint and they will look great! Wiener dog template Someone alerted me that this link didn't work, and it has now been fixed. ***UPDATE*** 6-11-14 One of my graduating eighth graders came to the house and so far has made a set of steps for his grandmother's back yard, a desk stand for his cell phone and started a table for his TV. He brought his little 2nd grade sister (going on to 3rd grade) and she successfully completed the wiener dog bookends. Back at school she has to be in 4th grade before being able to participate in after school wood shop. 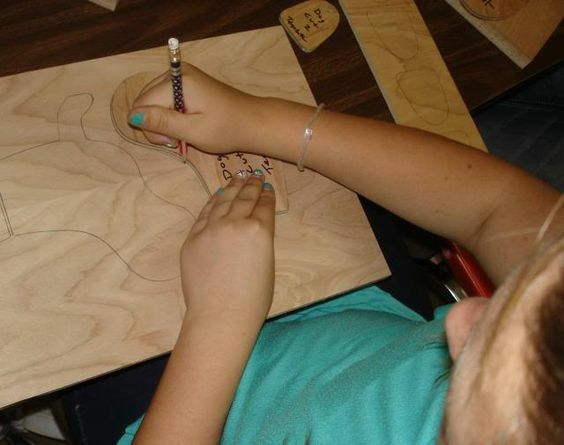 Mom (a former student of mine) says her daughters face lights up every time they talk about coming to summer wood shop. Her favorite project is building sculpture with wood scraps. ***UPDATE*** 8-19-14 We are beginning our projects and one of the returning 8th graders has decided to try making this pattern into a piggy bank. I encouraged her to go for it and told her before it gets assembled, I would like to trace and make patterns so other students could follow her. The best part is... I also had her mother in class. Tracing templates for the wiener dog bookends. 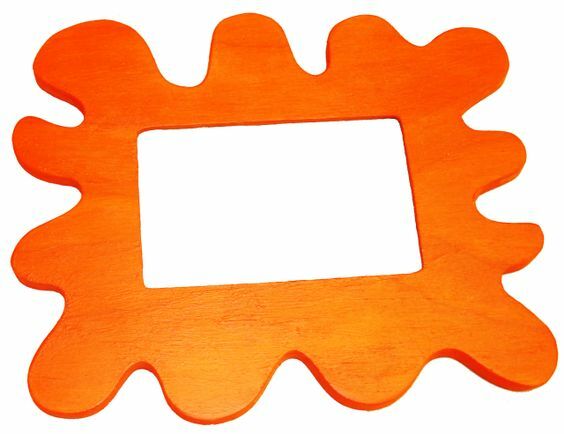 While next years choices, the bookends (one panel up) and Pegasus (five panels up) are becoming quite popular among the students and staff, this bright orange frame is made exactly like the popular wavy frame (top panel), except the wavy pattern is cut around the edges. Some of the kids tell me this color and shape makes it look like the Nickelodeon logo. As usual, the students are absolutely going nuts over all these new choices and don't want to wait until next year to make them, so I let some of them start making this frame and I'll keep cranking out the new ideas all summer long to be ready for them next year. Skip forward to view the jig for this frame. ***UPDATE*** I've had several students make this project, but somehow in all the shop activity I never got it photographed. 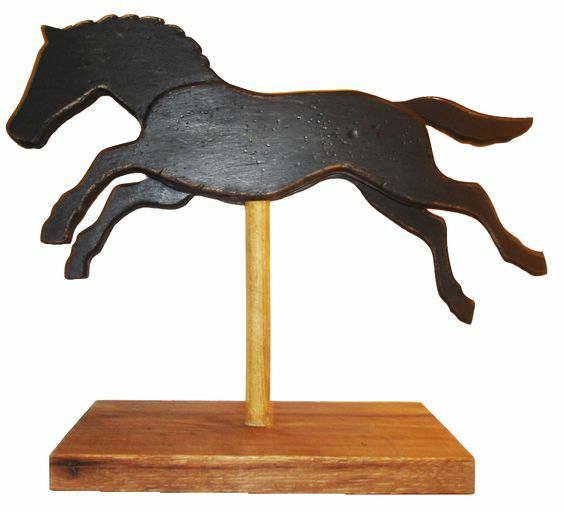 I use a project like the horse on a stand as a machine safety check off for my high school kids (add an arrow and call it a weather vane) It is a simple project, but it can make them use all of the machines in the shop. if you ever want to pay for plans http://www.sheilalandrydesigns.com/category/see-creatures is a cute fun project for kids. Plus the owner/designer is an awesome lady.